DIXON, Ill. (WLS) -- Two inmates who escaped from a boot camp in downstate Illinois were captured Monday. Jerrette Reed, 25, and Kevin Rivera, 20, vanished just before 6 p.m. Sunday from the Dixon Springs Impact Incarceration Program in Pope County, near the Kentucky border. 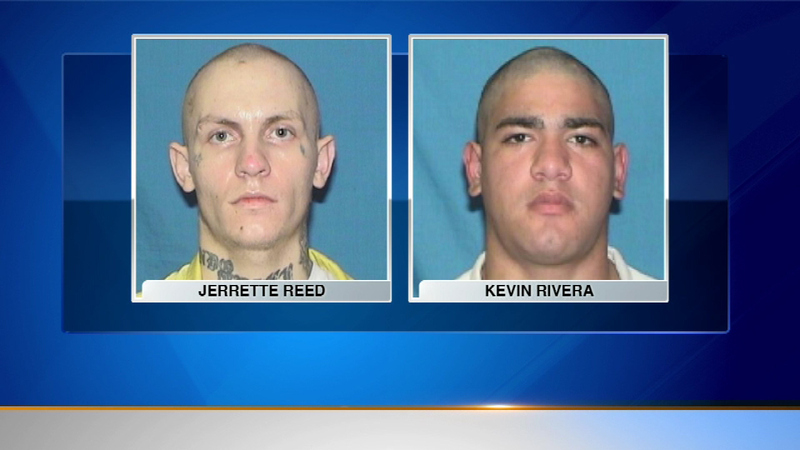 The Illinois Department of Corrections said Reed and Rivera was found around 9 a.m. Monday in a field about a mile west of the facility. They were apprehended without incident. Rivera was serving a five-year sentence for the manufacture and delivery of cocaine out of Cook County. Reed was serving a three-year sentence for meth-related charges out of Randolph County. Their escape is under investigation.